Lama Zopa Rinpoche, Ksitigarbha Day at Land of Medicine Buddha, Soquel, California, U.S., September 15, 2012. Photo by Dionne Wilson. There are many different ways of using the objects of the eight worldly dharmas, depending on the practitioner. Tantric practitioners use them in tantric practice, those following the bodhisattva path use them to generate bodhichitta and those trying to achieve the cessation of samsara use them to destroy their delusions. For worldly people the confusion caused by suffering only brings more suffering and confusion, but as Dharma practitioners we have the opportunity of making suffering extremely beneficial by using it to cut confusion rather than to create it. In order to achieve enlightenment we have to experience both physical and mental difficulties, but bearing such difficulties is incredibly worthwhile because by doing so we reach a state where all suffering ceases forever. As we progress along the path to enlightenment, problems become fewer and fewer and therefore whatever we experience at this time only helps to bring about the end of the suffering that has no beginning. We can learn to see a person who criticizes or harms us as incredibly precious and valuable.1 Because that person truly helps us destroy our worldly concerns and self-cherishing thought, he is worth more than mountains of gold and diamonds. Worlds filled with gold and diamonds can’t bring us real peace; only destroying the self-cherishing attitude can, which is exactly what somebody who harms us allows us to do. In that way, he is like a guru and we should treat him as more precious than our own life. One of my teachers, the first teacher to teach me the debating subjects in India, was Geshe Rabten Rinpoche, who later lived in Switzerland and started a monastery there. If any person or lama ever criticized him he would invite that person over to his house and give him a special lunch of momos and take special care of him to thank him for his help. One day when Gen Jampa Wangdu returned to his place he discovered that a robber had stolen a clock that somebody had offered him. He was immediately very happy that the robber had gotten his clock. That sentient being had wanted something, had been able to get it and had therefore experienced a certain degree of happiness. This is what made Gen-la happy. Due to his realization of bodhichitta, he felt completely equal with others; to him, others’ happiness was the same as his own. Another example of training the mind to cut the thought of the eight worldly dharmas is the great Italian saint, St. Francis of Assisi. Preferring criticism to praise, he asked his disciples to criticize him, something his disciples would never think of doing. He especially asked them to keep telling him he had done so many evil things that he would go to hell and so forth. His disciples, however, could see only the good in him and nothing at all to criticize. In that way, great meditators train themselves to like misfortune and, by transforming their minds, come to know great happiness. When we are trying to control our mind we can start to recognize that bad conditions are times when we can really transform our mind. There are many ways of thinking about a problem. We can see criticism, for instance, as the result of some previous negative karma that we have created. Then we can feel that there is nothing to be upset about because actually the result of that negative karma is finishing and we won’t have to experience it in the future. Thinking like this changes our mind. We worry less and are happy to be finishing that particular negative karma. We can also train ourselves to feel that the problem is the result of negative karma that we have created in the past by harming another being and therefore determine that in future we are going to be careful not to let that happen again, to not submit to this evil thought, our one enemy, and to try to subdue it as much as possible. The actual problem is not the situation itself; it’s our clinging to the four desirable objects. We have to realize the shortcomings of these four desirable objects and abandon clinging to them. This is the basic psychology. If we use this method, undesirable situations will no longer disturb us. When somebody praises us or when we hear that we have a good reputation, we can reflect on its shortcomings. A wise meditator knows that there’s nothing beneficial in having a good reputation because we become attached to it and pride follows. We start to believe that we’re really important and famous and many other delusions arise because of that. On the other hand, there’s nothing bad about criticism. It’s very good to be criticized because it stops delusions such as attachment or pride from arising. Criticism points out faults that we’re currently unaware of, allowing us to confront and correct them. Meditators usually say that they’re not happy when they’re being praised and much prefer to be criticized. In the same way, rather than upsetting us, not receiving a birthday present from a friend can cause us to confront and avert our attachment. We can think how fantastic it is that that person didn’t give us anything. If she had, attachment would arise, we’d become more conditioned to receiving presents, more under the control of the thought of the eight worldly dharmas, more unable to not create negative karma and more likely to eventually be reborn in the suffering lower realms. By not bringing us a present our friend saved us from all that. She really, truly is our dearest and best Dharma helper. Reflecting like this – seeing that meeting unfavorable conditions is not, in fact, a problem – is the complete opposite of how attachment sees the situation. Before, under the control of attachment, we were incredibly angry with the person who “harmed” us but now, thinking the complete opposite, that uncomfortable mind – that schizophrenic, nervous, unhappy mind – instantly disappears and we have a good feeling for that person. The best way to train our mind in equalizing the eight worldly dharmas is to expect to be criticized, expect to be disrespected, rather than the opposite. That’s the psychology. Then, no matter what actually happens, we’re ready and there’s no shock. It cannot harm our mind. The happiness we seem to get from the four desirable objects is false. It disturbs our mind and interferes with our search for true happiness. Understanding this becomes a great protection, and seeing how meeting unfavorable conditions is a time when we can truly grow, we can develop a mind that actually likes problems. By overcoming our dislike for the four undesirable objects we can complete all the realizations, cease all the obscurations and eventually attain enlightenment. In this way, no matter what happens, we’re able to maintain a continual Dharma practice. Nothing can interfere with it. Even if we’re just starting our practice and don’t yet accept reincarnation, by controlling attachment our mind can always remain undisturbed. Perhaps we don’t even consider ourselves to be a Buddhist, but if we use this practice when conditions change – when we lose friends, find friends, whatever – our mind will remain peaceful, in balance, undisturbed. Just as a rider’s peaceful nature calms her horse, so the elements of our body will also be undisturbed and we will enjoy much better health, with little risk of high blood pressure or a heart attack. As the great bodhisattva Shantideva said, we can use any problems we have in life to generate compassion for others. People who have AIDS or cancer feel very strongly for others who have the same disease. Because they’re experiencing the same problem themselves, they’re able to recognize how unbearable it is for others and therefore strong compassion naturally arises. In that way, the suffering we feel is very useful. Just as a broom sweeps away dirt, illness and other problems are the broom that sweeps away past negative karmas and obscurations. If we have a guru from whom we’ve received teachings, we should think that the problems we experience are his blessing to purify our negative karma. Excerpted from How to Practice Dharma: Teachings on the Eight Worldly Dharmas by Lama Zopa Rinpoche, edited by Gordon McDougall. 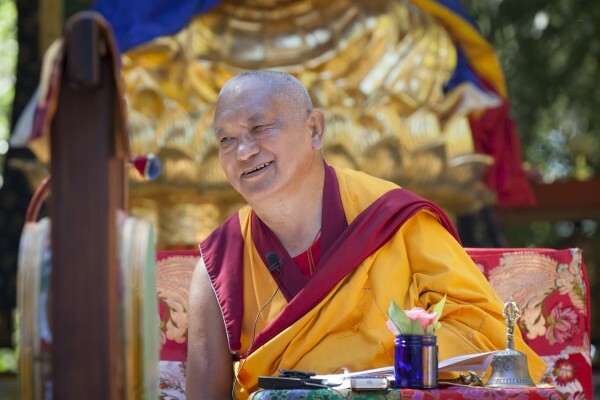 How to Practice Dharma is the second in Lama Yeshe Wisdom Archive’s FPMT Lineage Series (www.lamayeshe.com). 1. This subject, seeing those who criticize us as precious, is covered in The Door to Satisfaction, pp. 112-115. It is also extensively covered in Rinpoche’s lo-jong (mind training) discourses, including the book Transforming Problems.